The eat a chili for Chili challenge has been an overwhelming success, if you would still like to get involved to help with her remaining rehab, just film yourself eating the hottest chili pepper you can find, nominate friends to do the same, post #EatAChiliForChili, and help raise funds and awareness for Chili’s life-altering transformation. So easy for you and so beneficial to a wonderful dog that deserves nothing but the loves she puts in the world! Chili snuggling with her incredible and loving foster mom Christine. Chili is one of the gentlest, sweetest dogs we have ever had the pleasure of helping. She’s only got one problem (well, make that two): her two hind legs don’t work. She was abandoned at an animal hospital with two broken legs, that will require multiple operations to fix. So what can you do – eat HOT chili pepper for the sweet Chili dog and get uncomfortable for a good cause. Chili needs a life-altering operations so she can walk, run, and experience as much joy as she gives to those around her. It’s a bit like the #ALSIceBucketChallenge - but way hotter. We started #EatAChiliForChili - where some generous (and daring) people film themselves eating the hottest chili pepper they can find and nominate friends to do the same, to help raise funds and awareness for Chili’s life-altering leg operations and rehabilitation. So feel free to have a laugh at the #EatAChiliForChili videos submitted and follow Chili’s road to recovery via her instagram and facebook pages too! Chili's right hind leg x-ray, indicating several of the brakes in her femur. Detail for the life-changing surgery we are raising the money for: Chili's surgeries involve internal fixation of the broken femurs in her hind right and hind left legs. The surgeries will be staged since each leg will take hours of operation time and months of recovery time. There will be a large incision on each leg likely spanning nearly the length of her femurs. During the surgery Chili's muscles will be dissected until her femurs are exposed and can be re-aligned, once this is complete a large metal plate will be placed spanning all the pieces of the bone. And at that point and screws will be placed along the length of the plate to hold it in place. The plate will hold the bone pieces in this new alignment permanently. She will have the plates and screws for the remainder of her life unless they break or get infected. There's always a small risk of infection when putting in implants, and if they do get infected or break, it will require additional surgery to take them out and replace them. 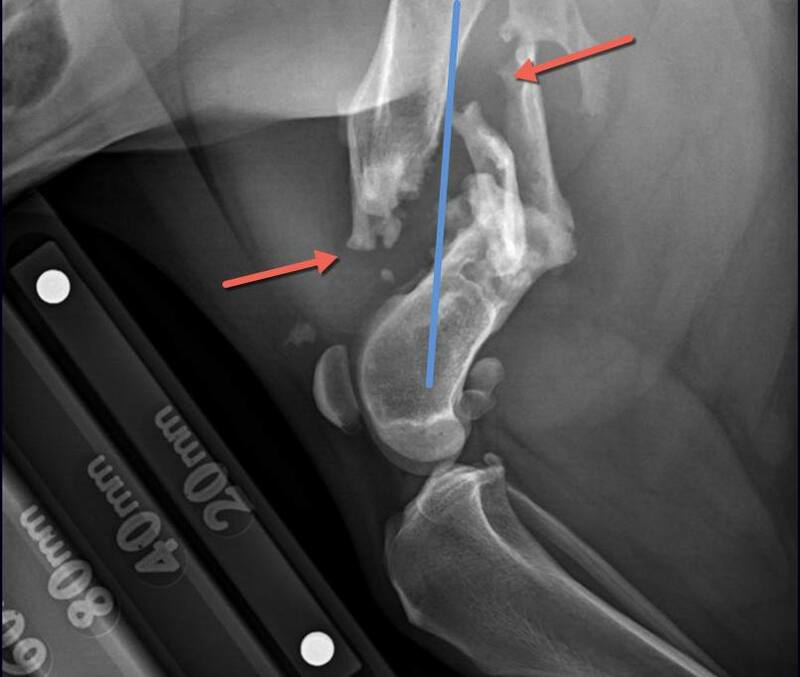 Chili's left hind leg x-ray, indicating several of the brakes in her femur. Why Chili's surgeries are more complicated than most: because Chili's injuries were neglected for months prior to her being abandoned. As a result, her doctors expect there to be months upon months of scar tissue that has built up, as her legs re-set improperly, which will need to be broken down and removed. This involves teasing out the scar tissue to the point where the breaks in the bone are no longer improperly connected and can be moved and re-articulating them into more normal anatomical position. This is incredibly challenging and will take up the bulk of surgery time. Doing this to a fracture that is just 2 weeks old can be difficult and time consuming, it appears as though her breaks are several months to a year old, making this surgery exceptionally challenging.